PONTE VEDRA BEACH, Fla. –– When St. Johns County developer Jay McGarvey offers new luxury homesites at Ponte Vedra’s Marsh Dunes II over the next year, there’s something that won’t be included. A parcel to the north will instead be joining other acreage McGarvey donated in years past to the North Florida Land Trust. The parcel is part of the Guana River State Park wetlands, which provides critical flood protection for the area and habitat for native species. The veteran developer is not required to set this latest property donation aside as part of a wetland’s mitigation plan. He’s simply continuing a long-standing tradition of preserving what makes Florida a special place to the people who purchase homes here: its natural resources. Conservation in Northeast Florida is in a race against time, said McCarthy. Development is happening quickly—faster than money is pouring into the Land Trust’s coffers. In that race, McGarvey has been a leader among developers. 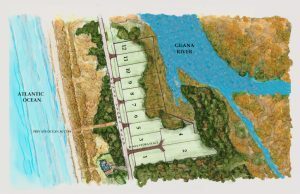 He kicked off the Land Trust’s preservation of the Guana River Preserve in 2004 with a donation of 39 acres, and then persuaded fellow developers to come forward with contributions of their own. McGarvey’s was the first donation ever made to the Land Trust in St. Johns County and the second to the organization overall. It would be the first of many contributions from McGarvey to the Land Trust in the years that followed. He pegs the economic benefit at $1.6 million. McGarvey’s commitment to quality of life in Northeast Florida extends to other philanthropy as well. As chairman of the Board for the Beaches Habitat for Humanity, he oversaw the conceptualization and development of Ocean Walk, a 70-unit community for low-income residents on Mayport Road in Atlantic Beach. McGarvey also donated funds for historic preservation of a community building in St Augustine Beach and for the construction of St Augustine Beach’s Splash Park. He donated land for a nearby library and provided landscaping for all St. Augustine Beach medians along Highway A1A. Since 1980, the focus of McGarvey Residential Communities has been to “build communities that last for generations.” As a result, they have developed some of the most enviable neighborhoods in North Florida. Now, add Ocean Ridge and Marsh Dunes II to that prestigious list. McGarvey’s thoughtfully designed and heralded communities in St. Johns County include Sea Colony, Sea Grove, Anastasia Dunes and Sea View. For more information contact McGarvey Residential Communities at (904) 247-9160 or visit www.mcgarveycommunities.com.